This is a seemingly rare photograph of the ’Penny Long Ride’ which was a boat, mounted on a cart and pulled by a horse. Children paid their penny and sat on benches round the sides of the boat during a ride around the streets. The writing on the side reads ’Pride of the North’. This was my favourite, it used to come round Fairfield 😊 Childhood memories. My husband remembers the ride when he lived at Ramsey Road, Roseworth. I used to go on this until the late forties. It was a summertime treat, being driven round about six streets in Portrack. It make you think about the value of money in those days. If each kid paid one old penny, that meant about a shilling a load or 5p in modern money. Each trip would take about ten minutes including loading and unloading, so that is 30p an hour. I would guess that because the horse was raced a bit on each trip, that the driver could not get in more than two hours an evening. On top of this there would be getting to and from the pick up point. I would guess that it was really done to provide fun for everyone. Except the horse! I remember feeling so special when, on the “Penny-a-Long-Ride” in the late 1940s, I was allowed to sit alongside the driver. We kids who lived near the “Gas ‘ouse” in Stockton really were enthusiastic and excited whenever this ride appeared in the street. Such an entertainment could never happen now, “Health and Safety” would prevent it, but kids were hard and tough then. Got a shock when I saw this as I am the girl 3rd on the left my name was Joan Penman and we lived in Webster Street. This must have been taken about 1955 when I was 7 or 8. It’s strange to see yourself from so long ago. In those days in the late forties old Stockton, the Gas House, Portrack, Tilery etc. the streets were cobbled, no tarmac. I also used to ride on the ” Penny a ride ” as I called it. I lived in 70 Bickersteth Street near Parliament street and Bowesfield Lane. It would do a few laps of all the streets within that boundary. This was probably mid to late fifties, early sixties. Fond memories. Can’t ever remember The Penny Long Ride ever coming on the Newtown / Brownsbridge estate. Perhaps because all the roads were on very steep hills?. The only two long roads were Wrensfield and Dunmail. “Penny a Ride” As they rode in to Ragworth (Dumbarton Ave. – Dundee Ave. – Dover Rd.) the shout was always “LAST RIDE”. This ensured all the kids came straight out for it. Single decker & double decker carts. My wife was working in a Billingham nursing home some years back as a cleaner and she saw this photo on a residents table. She started talking to Tommy about the ride and both ended up with tears in their eyes, don’t know if this was caused by them laughing too much about their memories of this Ride or about life’s quirks. I to remember the penny a ride, it used to go down Rochdale Avenue in Roseworth. I remember going on this ride, we all loved it. It was magical. We used to go around the block, Rostrever, Roseneath, and Rampside. Does anyone remember Wendy Marr of Cauldwell Close, Hardwick? I used to live 17 Caudwell Close from 1960 to 1975! where did Wendy live? Myself and 2 sisters were born and raised on Gilpin street, we went to Gilpin St school. I remember Miss Skinner head mistress, Mr Wheeldon teacher ,Miss Turnbull teacher, can anyone else remember children or teachers? Mr Perry was caretaker, from Jennifer, Margaret and Anne Brace would love to hear from somebody thank you.. I remember this, during the early fifties as ‘the penny ride’ not ‘the penny long ride’. Were us Thornaby kids being short changed and did they get longer rides elsewhere? Joking aside, my husband remembers the same cart being used by Mr Lightowler to sell fruit and veg on days when it wasn’t used for the ride. This would have been in Norton – not sure when but probably during the forties. Owner of Penny Ride Was named Lighthowler. Just a note re the single decker – double decker debate. My wife lived in Oxbridge in the 1950s and distinctly remembers a double decker coming around the streets. Maybe this was a later model to the ride shown in the photo as she also recalls the wagon having rubber tyres and not wooden wagon wheels. I WENT ON THE RIDE OFTEN. I LIVED IN PAXTON STREET OFF GARBUTT STREET. I ALWAYS TALK ABOUT IT TO MY CHILDREN AND GRANDCHILDREN AND THEY JUST LAUGH. I can remember one or two occasions when this ride visited the Thornaby Five Lamps area. The driver then touted the area seeking business. My mother wouldn’t give us the penny needed to go on it and so we, a gang of small children, chased it up and down the streets watching its progress. The importance of this ride is the owner was showing us a bit of enterprise, a way to make money and providing lots of fun for children by doing so. It was people like him who made Britain. Five million Mr Lightowlers today would do Britain a lot of good. I remember going on this same ride in Thornaby around Cranworth Street area when I was about eight years old. Fond memories and a very special treat. Went on this lots of times, it was a wonderful summertime treat. We always called it ‘The Queen Mary’. I remember that this ride was used by politicians to get people to vote for them by giving free rides on voting day. Frank, Bob, I was born in 1947, a Newtown lad, but I know exactly what you mean. In the summer holidays we would be off on our bikes down the A19 and not get home till after dark. Our parents wouldn’t be worried at all, it was a safer, nicer era than today. Meccano & model planes were the in thing as well. CAROL – THANK YOU FOR YOUR COMMENTS ON THE PENNY LONG RIDE, IF YOU WOULD LIKE A COPY OF THE PHOTOGRAPH YOU CAN CONTACT THE PICTURE STOCKTON TEAM. Well said Frank. I was part of the Green lads but from the other side to where you lived. They were great days, we made our own fun. Out early morning and home at sunset. Parents never worried. We could go for a long walk probably over the Station fields to Wynyard and Wolviston. The countryside was on our doorstep. A bottle of water and jam sandwiches. We had good summers and bad winters which gave us the advantage of sledging in the showfield. As you say good days as we remember vividly. Can we settle this once and for all, there was a double Decker which came round Roseworth causing my children to pester me for pennies which they always got. I have a feeling it was only brought out for the smoother and wider roads as it was quite large. Health and safety, if they had been around, would have swooned like blushing maidens had they seen it and riding alongside the driver on either float would have been banned. On a sad occasion last week we were on the Green and I told my Grandson of the Titanic games of cricket football rugby and marbles we played there. Of the roller skates top and whip and the bogies made from old pram frames and sledging in the sand pots. It made me sad that he did not really comprehend what such things were or how we could have fun without Computer games, Wii’s and such – did you not have television, no, what did you have then, Radio, the tuppeny rush and pictures that changed twice a week. At least he did not say ‘how boring’ as one youngster said to me one day. Their life seems to be shut in their own rooms with every kind of electronic game, at least we can get them out walking camping and playing some games, their Dad and Mum insist on it as others should. I realise that being brought up round the Green at that time was a privilege, other boys and girls never had that chance of a wonderful carefree life which we had even in war time, we green boys and girls lived and enjoyed a life that vanished with us as we grew and left for the forces marriage and other reasons. It can never be the same again though I would not exchange places with today’s children with all their hi tech toys, what, give up Mechano, Balsa wood plane making, brown paper and bamboo kites plus the freedom to roam the lanes and fields without fear? I know who had the best of it. How lovely to see this picture, I’ve told so many people over the years what a treat it was on the day that ‘The Ride’ came to your end! I wonder what the equivalent could possibly be today? I too had a memory of a double-decker, but it was just the steep climb up. Thank you Barry Parkin for this trip down memory lane. (NUGGET) NUGENT, WE MOVED TO BLUE HALL FROM SWAINBY ROAD IN 1962. I have named the street above that the ride is parked in Barry, it is Milton Street & the back wall belonged to Billy (Nugget) Nugent’s family, who later moved to the Blue Hall Estate, Norton. Sorry, I don’t recognise any of the children. SINCE I SUBMITTED THE PHOTO OF THE PENNY LONG RIDE ON THIS SITE, KINDLY SUPPLIED BY LENNY LITTLEFAIR, THE FEEDBACK HAS BEEN BRILLIANT, I WAS HOPING THAT SOMEBODY WOULD SUPPLY NAMES OF THE CHILDREN ON THE RIDE AND THE STREET THE RIDE WAS PARKED IN, I AM LED TO BELIEVE THAT IT IS AROUND THE GAS HOUSE AREA. I remember when the penny a long ride used to park at the end of Milton Street, near where Kenny, Paddy & Margaret Shaw lived in the late forties. They were my family. Kenny was my dad, Paddy my uncle and Margaret Shaw was my beloved nana, Mag. How great it would be to have a model made of the ‘penny a ride’ – it would be great sitting on a mantle shelf. I also think people are getting mixed up thinking there was a double decker, maybe because of the high steps you had to use to get onto it. This should be a model for a statue, to be mounted in Lightowler square, so many kids enjoyed the penny a ride. He came up to Roseworth regularly. I never paid more than a penny a ride, but as kids got off, you got to move forward, ultimately, sitting next to Lightowler himself for as long as your pennies lasted. I never saw a double decker, this is it, the penny a ride! But those steps at the back were high and steep, but there was always the coachman at the rear to help kids up. A magic photograph! Luke Casey & Mavis also have a daughter, Siobhan, who is a presenter on Tyne Tees Television. Mavis Lightowler was the niece of Tot Lightowler. Her family lived in Ancaster Road on the Blue Hall estate. I remember Tot Lightowler comming round Norton with the Penny Long Ride, he also used to have a fuit cart which he would park outside the Avenue picture house on a Saturday night and in the winter he would have some sort of stove or brazer on the back and cook horsechest nuts. As I remember it Mr Lightowlers daughter, Mavis, was a beauty queen at the time and she went on to marry Luke Casey from the TV and their son, Daniel, starred in the ‘Midsomer Murders’ series. Yes I remember the penny ride used to get on outside Thompsons corner shop at the top of Kingston Street, over the road from George Rochfords shop. I can remember this ride very well, like most kids at that time I would pester my Mum for a penny and if you were very lucky to ride beside the man at the front was a real treat – what joy, we were so easily pleased in those days. I used to live in Buxton Street. Yes, you are right John and Keith, it was a double decker when I think about it. The memory is not what it was obviously. I think this was their early version of the penny long ride. I’m pretty certain the later version was a double decker. More money to be made with twice as many passengers! That’s progress for you, even in those days! I think Mr Lighthowler was the first person to bring pester power to Portrack, I used to pester the life out of my Gran for an extra half-penny to let me have a extra long ride around two streets. I was once having a ride from St Anns Terr to Elliot st when the old horse slipped and fell on the wet cobbles. I ran home crying and I don’t think that is was too long after that that the ride was no more, but we still went down to his small holding at the top of the stony rd to see the horse. I also thought the penny long ride had an upstairs and downstairs, and I also remember if you payed 2p you could sit at the front with Mr lightowler. Sometimes if you give the horse a bucket of water you got a free ride. Ah, at last, the good old Penny Long Ride. If I remember rightly, its was painted in red, white and blue stripes. As you say, so many people have fond memories of this old boat. Life was much more simple then. I wonder what my grandson would say if he got the chance of a ride on this!! I went on the penny ride many times as a kid when we lived in Light Pipe Hall Road in Oxbridge. I also seem to remember a bigger version of it, one which had an upstairs and a downstairs to it. Does anyone else remember a different version to the one in the photo? Or is it just that things in our past memories always seem much grander than they really were!! Being very young at the time this boat seems so much smaller than I remember it, interesting to note the inscription on the bottom of the boat that children are insured to ride on it!! Great photograph. I think it could be Fenny Street end of Milton Street where he used to park the ride when he was round the Gashouse area, the wall to the right of the back alley looks like Nugent’s backyard. This is a FANTASTIC pic – I have written on this site of my rides on it. I am so pleased to see what was only in my memories Great and a big thanks to Lenny Littlefair, how was he connected to it? THIS PHOTOGRAPH WAS KINDLY LOANED TO ME BY LENNY LITTLEFAIR TO PUT ON THIS SITE. 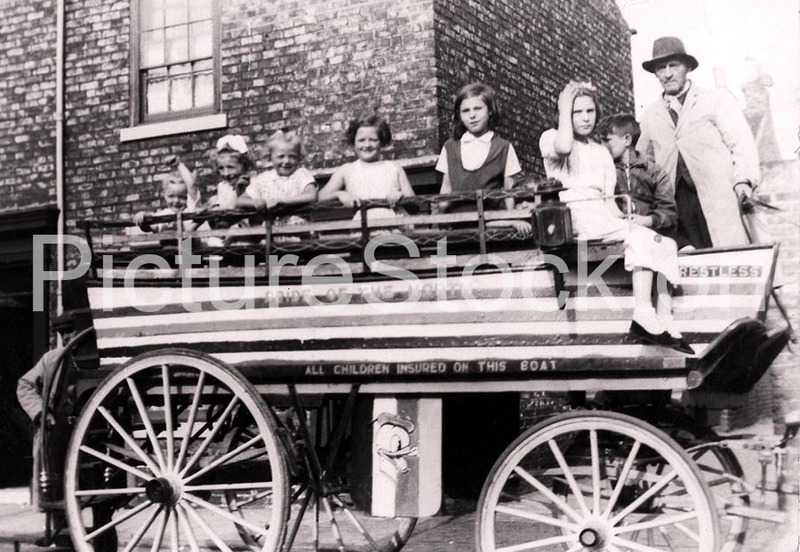 IT WOULD BE VERY INTERESTING IF ANYBODY RECOGNISES THE CHILDREN SITTING ON THE RIDE AND IF AT ALL POSSIBLE THE STREET THE RIDE IS IN, I HAVE BEEN TOLD IT COULD BE AROUND THE GAS HOUSE AREA. I MYSELF HAVE MEMORIES OF THE PENNY LONG RIDE, WHEN IT CAME TO SWAINBY ROAD THE BEST TIME TO HAVE A RIDE WAS THE LAST ONE, THEN IT WOULD LEAVE SWAINBY ROAD AND TRAVEL OVER TO TILERY, SO YOU DID GET A PENNY LONG RIDE.